A few days ago we announced that Warner Archive would be releasing this underrated and often forgotten sequel for the first time on Blu-Ray as part of their Warner Archive Collection line. At the time, no details were included, other than just a general announcement for a release sometime in 2018. 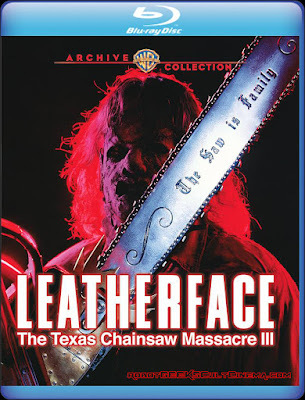 While they still don't offer a release date, they did provide the full technical details regarding the release, with the one thing that most fans wanted to know finally being answered, and that is that it will in fact include the Unrated Cut. Interestingly, it appears these are the same exact extras located on the previous DVD release way back in 2003. So sadly, nothing really new was created for this release as they just imported things from the aforementioned 2003 DVD. While this film never got the cult status that the often reviled Part 2 got, it's still a great film in it's own right, and a far better film than most people give it credit for. It's a solid film and a solid sequel if you just give it a chance. We'll be sure to let you know when a release date is eventually announced. Regardless of when that day may be, I for one am looking forward to this. I love it and will be glad to add it to my collection in HD.